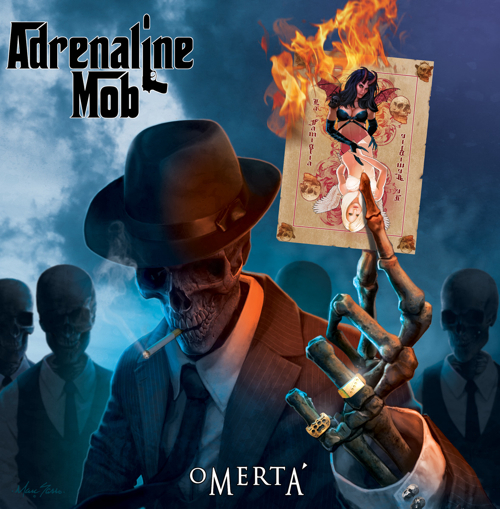 After last year’s release of the five-song self-titled EP which gave everyone an introduction and a taste of their musical style, Adrenaline Mob, the new band featuring Mike Portnoy, Russell Allen and Mike Orlando in its ranks, is ready with their debut full-length “Omerta”. The album includes all four original tracks from the EP, along with six new songs and a cover of Duran Duran’s “Come Undone”, featuring Halestorm’s Lzzy Hale as guest vocalist. I’ve always been a huge fan of Russell Allen’s work as vocalist of Symphony X, and his voice constantly reminds me of Ronnie James Dio. And of course, Mike Portnoy’s virtuosic drumming is second to none, specially in the prog rock realm. 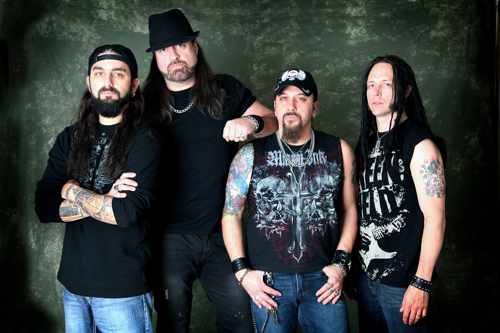 But, the most interesting thing about their collaboration in Adrenaline Mob is that it sounds nothing like the music they are known for, and presents a relatively straightforward hard rock style . The album is characterized by catchy riffs and a concise, to-the-point song structure, as is exemplified by tunes like its first couple of tunes. “Undaunted” is a great start to the album and hard rock fans should find themselves instantly hooked to it, and “Psychosane” isn’t a bad tune by any means, but for me it took some getting used to mainly because the pinch harmonics remind me too much of Zakk Wylde. Other than that, every aspect of it is top-notch. The next two tracks “Indifferent” and “All On The Line” are a little easier on the ears, more “radio-friendly” if you want to call it that. The slowness of the latter puts the focus on Russell Allen’s vocals, and he does a great job at carrying the tune almost singlehandedly. After this brief departure, the album returns to its hard rock feel with solidly crafted and thoroughly enjoyable tunes such as “Hit The Wall” and “Feelin’ Me”. The Duran Duran cover comes next, and the band has done well to recruit Lzzy Hale for this one. She is, without a doubt, one of the top female rock voices today, and enhances this cover tune greatly by leaving her stamp all over it. Her combination with Russell Allen indeed comes across as very powerful. Mike Orlando really comes into his own on the next three tracks and expresses himself quite freely with some delightful solos and acoustic guitar fills, an aspect that actually makes the bottom half of the album even better than the top half in my opinion. The top half definitely has the catchier songs, but Orlando doesn’t quite get the chance to display his skills on the guitar as much as he does on “Believe Me”, “Down To The Floor” and “Angel Sky”. But on the whole, this ensures that the album is enjoyable throughout, and also has variety. It comes to an end much in the same way it started, with the short, hard and gritty “Freight Train”. Adrenaline Mob’s debut full-length is a stellar effort. This album is enjoyable not only at home, but should also make for a great live show. The band is certainly not reinventing the wheel here, and they’ll be the first ones to admit that they never set out to do so. But, the combination of these great musicians is very potent, and their collective sound displays great chemistry. It sounds very much like a cohesive effort, and from the music it’s clear that these guys know each other inside out. Amidst the massive abundance of extreme metal that’s released on a weekly basis, it’s rather refreshing for me to get a chance to listen to a great hard rock album such as “Omerta” for a change. Russell Allen should be proud of his efforts as vocalist on this one, and Mike Portnoy has proved himself as a versatile drummer, adjusting brilliantly to the vast change in musical style from Dream Theater to Adrenaline Mob. As I mentioned earlier, Mike Orlando has played his part excellently as well. The end result is a great 50 minutes for hard rock fans to savor.